The Draw at Sugar House provides an easy pedestrian and bicycle connection from the Sugar House Business District and Hidden Hollow to Sugar House Park. A remarkable piece of engineering and art, The Draw doubles as both street crossing and a heavily-engineered dam for flood water from Parley's Creek. The spillway is also a magnificent piece of public art designed by world-renowned environmental artist Patricia Johanson. 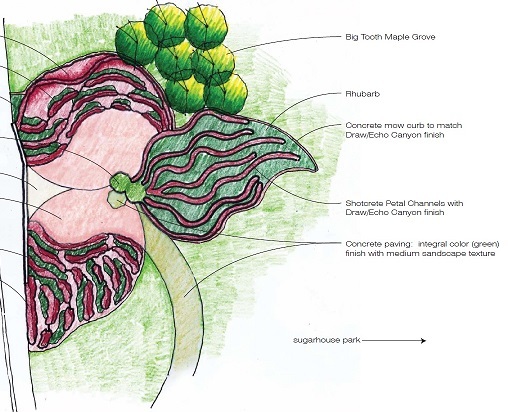 It incorporates drought-tolerant landscaping, paving and free-form sculptures to suggest a huge Sego Lily rising from the floor of the plaza. At the west end of the tunnel are three towering concrete pillars, reminiscent of the iconic "Witches" rock formations in Echo Canyon. Construction and landscaping to be completed in Spring 2018.